This 3yo gelding by Street Cry was a sale topper at the Perth Magic Millions. He's been purchased as a tried horse and has completed his spelling and ready for a return to the stable life. He's a stunning individual and perfect to get you to the races before winter is out. STREET CRY (IRE) (Bay or Brown 1998-Stud 2003). 5 wins-1 at 2, Dubai World Cup, Gr.1. Champion Aust. Sire 2015-16. Sire of 1512 rnrs, 1064 wnrs, 118 SW, inc. Winx (MVRC WS Cox P., Gr.1), Zenyatta, Street Sense, Oh Susanna, Shocking, New Year's Day, Whobegotyou, Tomcito, Long John, Street Boss, Pride of Dubai, Seventh Street, Heavens Above, Stay With Me, Lyric of Light, Victor's Cry, Majestic Roi, Here Comes Ben, Street Hero, Cry and Catch Me, etc. LAMASERY (g. by Commands). 11 wins from 1400m to 2400m, A$630,450, ATC Hill S., Gr.2, Kingston Town S., Gr.3, Colin Stephen H., Gr.3, VRC Johnnie Walker S., L, AJC Dover Heights H., Australia Day at Warwick Farm H., ATC Mad Mex Fresh Mexican Grill H., Tony & Manera Lahood H., 3d ATC Metropolitan H., Gr.1, NSW Tatt's RC Chelmsford S., Gr.2, 4th ATC Warwick S., Gr.2, GCTC AD Hollindale S., Gr.2, MRC Zipping Classic, Gr.2, ATC Sky High S., L.
Rivalled (g. by Commands). 4 wins from 1000m to 1600m, A$82,790, AJC Lurnea H., ATC Jim Beam H., 3d ATC Endeavour Foundation Packaging Services H., Canterbury Park H.
Spun Dry (g. by Hard Spun). 3 wins to 1500m, SAJC Corporate Events H., 2d SAJC Camp Gallipoli H., 3d SAJC Jim's Cleaning H.
Tune Out (g. by Canny Lad). 8 wins from 1400m to 2050m, A$119,881, to 2016-17, 2d MVRC World Class Locally P.
Platinum Power (f. by Commands). Winner at 1500m in 2016-17 in Aust. 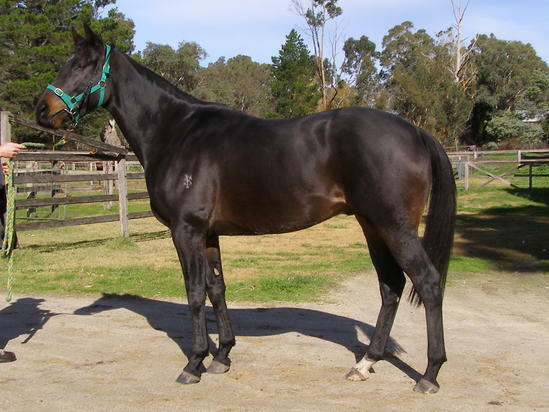 Doggerel (g. by Lonhro). Winner at 1450m in Aust. Busker's Ballad (g. by Street Cry). See below. ANTHEMS (Palace Music). Second top colt on the 1995-96 Australasian 2YO Classification. 10 wins-6 at 2-from 1200m to 1600m, A$860,368, QTC Queensland Classic, Gr.1, Sires' Produce S., Gr.1, NSW Tatt's RC Roman Consul S., Gr.3, AJC Fernhill H., L, Newcastle JC Cameron H., L, QTC Brisbane H., L, AJC Gold Rod 2YO H., Herbert Jones 2YO H., STC 13 Find H., 2d AJC Champagne S., Gr.1, STC Phar Lap S., Gr.2, 3d AJC Challenge S., Gr.2, Hobartville S., Gr.2, BTC Courier-Mail Classic S., L, 4th STC George Ryder S., Gr.1, AJC Stan Fox S., Gr.2, Newcastle JC Newmarket H., Gr.3, AJC Breeders' P., L, STC Royal Parma S., L.
YELL (Anabaa). Champion Sprinter in Australia in 2002-03. 9 wins-2 at 2-to 1400m, A$1,566,450, MRC Futurity S., Gr.1, CF Orr S., Gr.1, MVRC Australia S., Gr.1, Norman Carlyon S., Gr.2, STC Canterbury S., Gr.2, MVRC CS Hayes S., Gr.3, BTC Golden S., L, MRC Veuve Clicquot S., L, MVRC Ian McEwen Trophy, L, 2d MVRC Manikato S., Gr.1, AJC TJ Smith S., Gr.2, SAJC Breeders' S., Gr.2, STC Todman Slipper Trial S., Gr.2, BTC Champagne Classic, Gr.3, MRC HDF McNeil S., Gr.3, Moonga S., Gr.3, Bletchingly S., Gr.3, 3d MRC Futurity S., Gr.1, MVRC Mitchell McKenzie S., L.
TIGER QUEST (Where's That Tiger). 6 wins-2 at 2-to 1200m, R598,950, Turffontein Gardenia H., L, Magnum Mile Day P., WPT Emperors Palace Alpha 8 Day H., 2d South African Fillies Nursery, Gr.2, Turffontein Camellia S., Gr.2, Vaal Banyana H., L.
Race Record: 7 Starts 0-0-1 A$4,610.